Kids quickly grasp that weight up high makes a thing less stable: think of a pogo stick, stilts or a unicycle. It is equally plain that weight down low makes a thing more stable: Weebles wobble, but they don’t fall down. What is less obvious to kids and grown-ups alike is how free surface effect — liquid sloshing freely from side to side in or on a boat — functions like an invisible hand rocking a boat closer to the point of capsize than we know at a given moment. 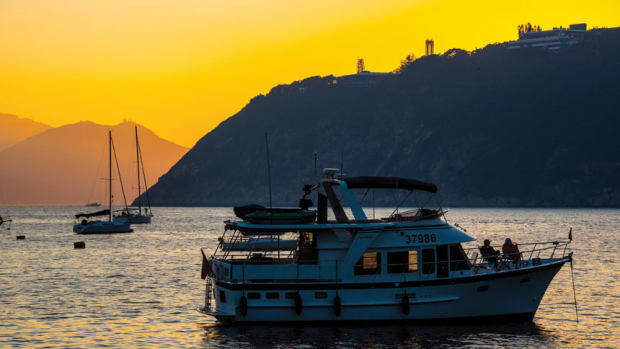 Everything in or on a vessel has its own center of gravity — the engine, the batteries, the anchor, the cooler of beer, the cruising guide and, of course, the liquid in your tanks. According to the weight and location, everything aboard contributes to the position of the vessel’s overall center of gravity (CG). Low weights bring the CG down; high weights raise it. Heavier things influence the position of CG more than light things. 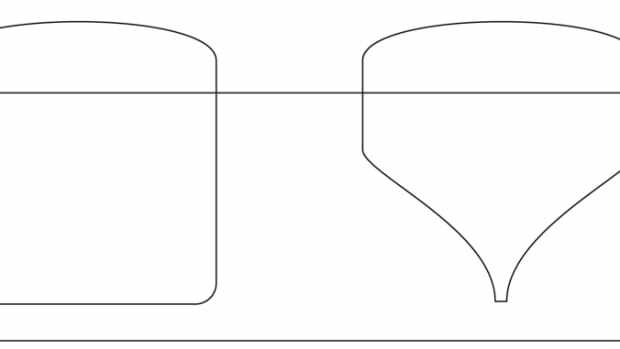 Off-center weights can pull CG off the centerline, causing the vessel to list. Ideally, the cumulative effect of all these weights is a CG that is on the centerline and sufficiently low for the foreseeable operating parameters. In a perfect world, once a vessel’s stability is established it would never change. But it does change, for many reasons, including free surface effect (FSE). Consider what happens on a small boat when several people move to one side. They bring their own centers of gravity with them and, in doing so, pull the overall CG off centerline. The vessel lists. What if those same people rushed from port to starboard, back and forth continuously? The boat would roll deeper and deeper and possibly capsize. This is akin to how FSE works, only you can’t see it so you have to imagine it. Vessels are designed so that weight doesn’t easily shift with the motion of the vessel. Things are secured, or can be secured, in some fashion. But you can’t tie down liquids; they can go where they want. The result is that liquids sloshing from side to side increase the magnitude of a vessel’s roll so that it rolls deeper than it would otherwise. If the vessel rolls far enough it may exceed its range of positive stability and keep on going. Let’s consider some of the sources of FSE in a boat: water tanks, fuel tanks, holding tanks. On a larger vessel there may be a lube oil tank and a tank for waste oil or even ballast tanks. Bilges can be a source of FSE, which is why eliminating bilge water is a standard heavy-weather precaution. Water on deck from breaking seas not only raises the center of gravity by momentarily adding weight, but also generates a free surface while the water is draining. 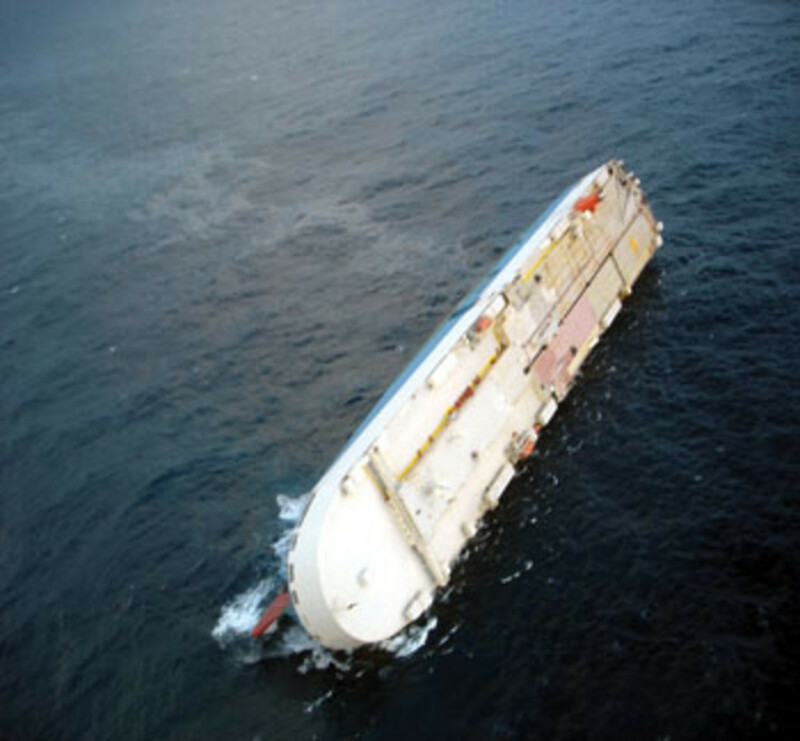 It is true that some vessels resist capsizing more than others, but FSE reduces the stability of all vessels. FSE is virtually never the sole cause of a capsize. There are usually other factors at work, too. But it can be the unappreciated dynamic that makes a manageable situation more hazardous. For example, there have been many instances where firefighting efforts introduced so much water into a vessel that it lost stability. A famous example of this was the SS Normandie, a passenger liner that was being converted to a troop carrier in New York Harbor during World War II. A welder accidentally started a fire aboard, and shoreside firefighters did what they do best until the vessel rolled at the dock. In other cases, an elevated center of gravity (lots of people on a flybridge) with a beam sea can conspire with free-surface liquids to roll a vessel beyond the point of no return. And then there is heavy weather, a situation where the crew and vessel are already being tested by large seas and strong winds. 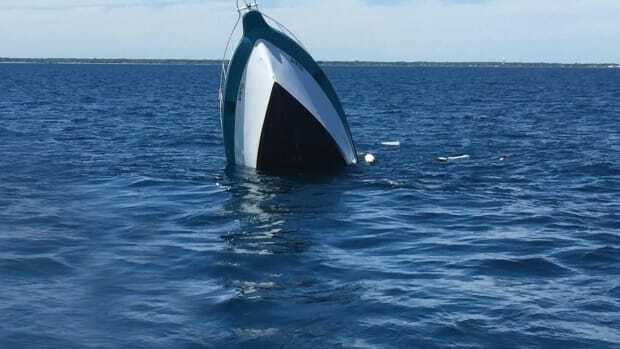 Under these conditions the contents of partially empty tanks can exaggerate the vessel’s roll, impairing rudder control and causing a broach. Deep rolling may interfere with oil levels and cooling intakes, causing the loss of essential machinery at the worst possible time. Throw a couple of big green seas on deck, along with an especially strong gust, and things can unravel in a twinkling. At this point it is probably too late to do anything sensible. So what are some strategies for managing FSE? First, it is important to recognize that a full tank acts like a fixed weight. It does not pull CG off the centerline when the vessel rolls. Similarly, an empty tank does not induce FSE because there is no sloshing. So if you anticipate heavy weather, or any situation where free surface could be a concern, consider transferring tank contents, or topping off tanks to minimize the number of partially filled (slack) tanks. 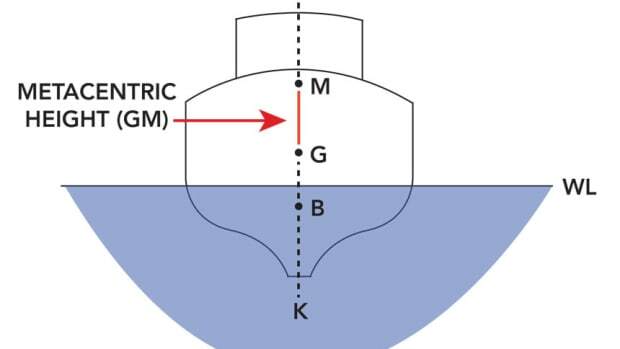 Try to do this so that empty tanks and full tanks balance out, leaving the vessel on an even keel. Such action is best done in port or under calm conditions. If the flying fish are already hitting the fan, moving liquids around to improve stability might well make matters worse. For vessels that have bulwarks, it is important that waterways, freeing ports and scuppers stay clear of obstructions. The size and locations of these apertures are specifically calculated to create drainage capacity for water on deck. Too often we see coolers, deck boxes, jerry jugs, anything that doesn’t have a better home blocking the way, thereby rendering these safety features useless. Instead of draining, water is trapped on deck, raising CG and inducing FSE. If heavy weather is unavoidable, try to keep weight low and steer a course that minimizes rolling and water on deck. Many larger yachts have tanks arranged in pairs — port fuel tank/starboard fuel tank, port water tank/starboard water tank, and so on. 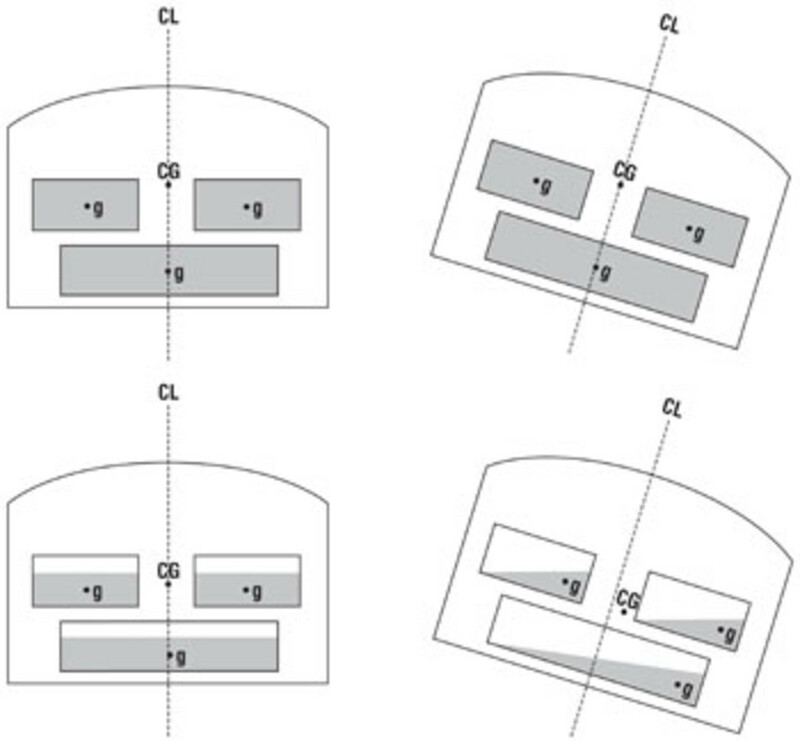 Typically there is a cross connection valve between these tank pairs so that liquids can be transferred as needed. 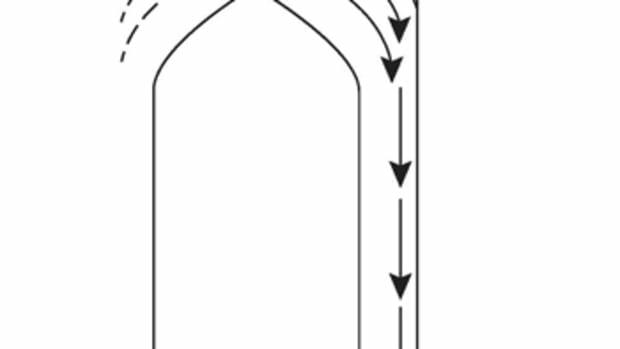 People often keep the cross connections open so that the tanks draw down at the same rate, thereby avoiding a list. This is a dangerous practice because if the vessel is inclined for a prolonged period (wind, seas, off-center weight), tank contents are free to flow from the high side to the low side, exacerbating the list and introducing confusion as to what the true source of the list is. This slow shifting of liquid is called hydrostatic balancing, a fancy term for liquid flowing from high to low in search of an equal level. Isolating tanks not only prevents hydrostatic balancing, but also minimizes the number of slack tanks at any given time. It is impossible to totally avoid free surface effect. We can’t sail around with all of our tanks completely full or completely empty. We can’t always run for harbor the moment the wind kicks up. But by understanding FSE and hydrostatic balancing, you can make wise choices about how to manage them and minimize one source of risk. Capt. Daniel Parrott grew up in Connecticut and spent 20 years voyaging worldwide on traditional sailing ships. In 2003 he joined the faculty of Maine Maritime Academy, where he teaches navigation, seamanship and bridge resource management. Parrott holds a USCG license, Master of Oceans, 1,600 tons and second mate unlimited, and is the author of Tall Ships Down and Bridge Resource Management for Small Ships. 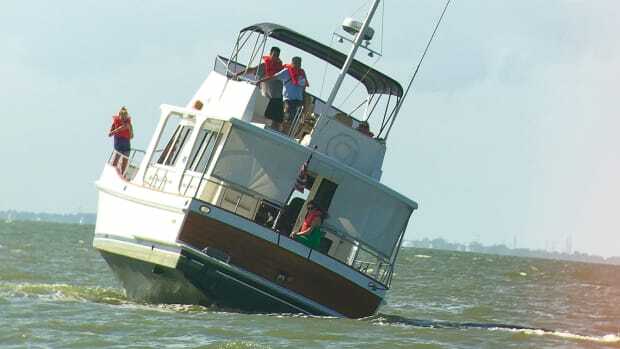 Positive stability is a vessel’s tendency to resist capsizing. Negative stability? Not so much. 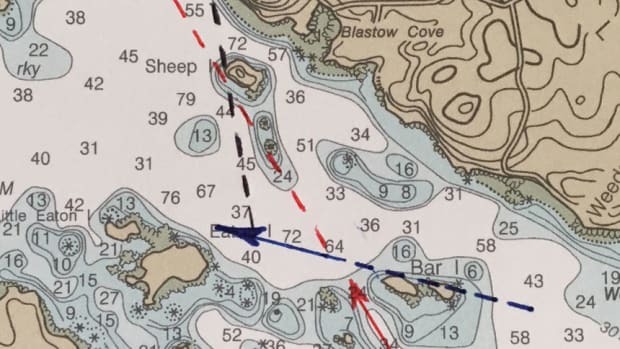 Knowing the individual components of your ground tackle system and how they each work is an essential first step in a peaceful night’s rest while at anchor.